Tara's House is a stunning, contemporary, luxury holiday home with 4 bedrooms to sleep 8. It is set well back from the road protected by a large rock outcrop that ensures privacy. You can hear the waterfall at the top of the site from the garden It has spectacular sea views overlooking Lough Foyle and the Atlantic and there are large hardwood picture windows to make the most of the views from within and and a spacious deck to enjoy the views and sea air from the garden. The house is 2 mins walk to a popular local pub, 10 mins walk to a blue flag beach, and is on the route of the new Wild Atlantic Way route and on path of the Inishowen Head walk and it a short walk away from Stroove lighthouse. It is also on the route of the beautiful 'Inishowen 100' scenic drive. There is one very large open plan living area with windows/doors to 3 sides giving superb sea and countryside views. The house is fully equipped to a very high standard with all new furniture and fixtures and fittings. The house is approx. 3 km from Greencastle village and about 8km from the seaside town of Moville where are restaurants and cafes. Further Information: The house is only an hour and a half by car from Belfast Airport and forty minutes from Derry Airport (along an extremely scenic route). From Dublin it is about a four hour drive. Activities in the area include sailing, shore walks, shopping, theatre and cinema in Derry or Letterkenny, summer festivals, sea angling, golfing (Greencastle, Ballyliffen and Redcastle), hill walking, scenic drives, Greencastle Maritime Museum, Guns of Dunree Military Museum, The Cairn Visitors Centre, Doagh Island Familm Village and Malin Head - Irelands most northerly point. Visit us soon and explore the rugged unspoilt beauty of Inishowen, ' the undiscovered treasure of Ireland' for yourself. We built Tara's House in 2008 - a real labour of love and we are very proud of the house and we love to share this very special place with our guests. It was designed by an architect family member and we all survived to tell the tale! We have replanted a rose that used to grow at the original cottage on the site as a memento to the history of the site. The site has the most amazing sea views and as the locals say 'it's feels different up here in Stroove'. It's a much longer story than that - which we'll tell you if you come and stay! Tara's House is unique in so many ways, not least it's contemporary design - a refreshing change from the usual dormer bungalows you see across Ireland. It is safe, private and best of all has completely wonderful sea views. The main bathroom is finished to a very high standard with beautiful bronze wall and floor tiling. In addition to the bath there is also an electric shower. The en suites are also beautifully finished, each with a walk in power shower with integrated light and extractor fan. All three bathrooms have shaving lights. We provide towels for the house and beach towels on request. The house has plenty of crockery, cutlery, cookware and kitchen utensils. Please let us know if you think something is missing and we will get it for you. There is plenty of tableware, glassware and cooking utensils. The dining table looks out over the garden and has fantastic sea views. Greencastle Golf Course is a 5 minute drive from the house and the Championship course at Ballyliffen is about half an hour's drive. There are also many other courses within easy reach. We have had many guests in wheelchairs stay at the house. the house is all on one level and there are steps from the doors to the patio, deck and from the front door. The house has underfloor heating with individual controls for each room. As the house is all on one level and tiled or fitted with wooden floors and is therefore very wheelchair friendly. We will consider pets as long as they do not go into the bedrooms and keep off the sofa! Please tell us about your pets if you make an enquiry. Cancellation: We offer a full refund up to 8 weeks before arrival. After this, a refund will only be given if the dates are rebooked by another guest Please note: This house is not available for parties of any description including school formal 'after parties'. If the house is booked for this purpose without telling the owner refunds will not be given. We had a great stay in this house. Communication with the hosts was great. All of our needs were met. The house itself is extremely comfortable and the view is beautiful. With small children, it was nice to walk down to the beach and then relax in the house afterwards with plenty of space for them to play. Thank you! Tara's house is of impressive modern design, very comfortable and well equipped, with lovely sea views through the large double glazed windows. The owners were very helpful. We visited wonderful beaches on the Inishowen Peninsular and the house is well placed to visit Northern Ireland too. We would happily return. Property in a beautiful location overlooking Lough Foyle to Nothern Ireland. So relaxing. This house had everthing you need to experience home from home! Lots of light and big windows to bring the outside in and enjoy those wonderful views. Quiet location and a great base for exploring around us. Beaches also superb. We had a great break and would 100% stay again. A wonderfully comfortable home away from home. Kate and Gavin were fantastic hosts who were helpful and attentive. We very much enjoyed our stay in their beautiful home. Highly recommend it. The house looks small from the outside but is actually quite spacious. The open planning living area, three bathrooms and well sized bedrooms was more than enough for my party of four adults and four young kids (and a dog). The house was both warm and comfortable with excellent facilities so when there were a few rainy days, being housebound was not a problem. The views are breath taking, looking out over the Atlantic coastline of County Derry. The house location is totally secluded so privacy is guarenteed. We've been renting properties over the last few years in Donegal and this has definitely been one of our favorite breaks. The only negative is that one week wasn't enough! Lovely house, beautiful views and wonderful hosts. Beautiful house with wonderful view. Very spacious and underfloor heating made it very cosy - even in the snow. The outdoor decking and garden made a lovely play space. Kate and Gavin are the most thoughtful hosts - the gifts of home made baking were delicious. Kate and son even rescued us when we got the car stuck up in the mountains! Would thoroughly recommend for a lovely relaxing break. 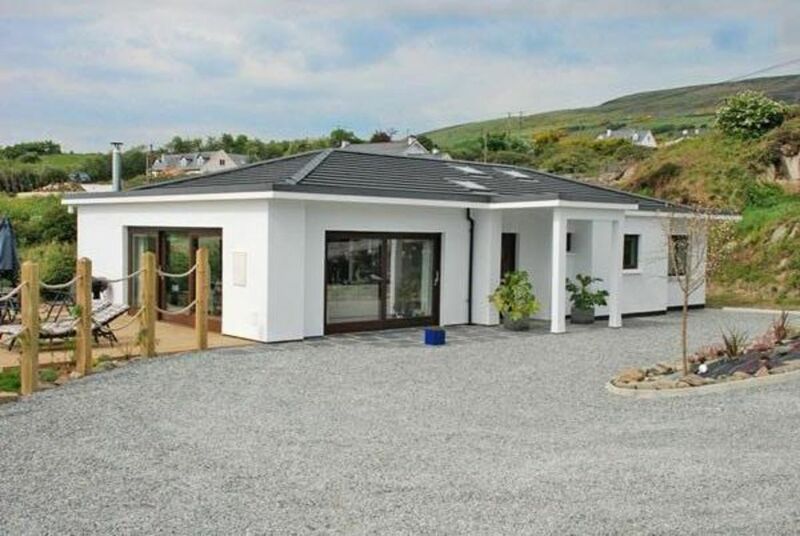 Tara's House is a 10 minute walk from a Blue Flag beach, a 2 minute drive to a links golf course (Greencastle), and is approx 3km from the fishing village of Greencastle, and about 8km to the seaside town of Moville. It is an ideal base for family beach holiday in a safe and peaceful environment. The house also serves well as a touring base for the Inishowen peninsula and Northern Ireland. The historic city of Derry is 30 minutes drive away and the Antrim coastline and the Giant's Causeway can be reached via the Greencastle-Magilligan ferry. The house is a great place for families, couples, friends, golfers, artists and anglers, and also for those just wanting a quiet and beautiful place to relax. Activities that can be enjoyed in the local area include sailing, kayaking, shore walks, beaches, shopping in Derry, Millenium Theatre in Derry, Summer Festivals, Sea Angling, Golfing (Greencastle, Ballyliffen, Redcastle), Hill Walking and Scenic Tours. Other Activities: Relaxing and doing nothing!